I take the privilege to welcome you all to the Dept. of Electronics and Communication at RCET. It is a matter of immense pleasure and pride that Electronics Communication Engineering Department have shown consistent progress, in academic and co-curricular activities with the help of highly motivated and dedicated faculty. Overall development of the students is the main goal of ECE department. Electronics and Communication Engineering (ECE) is a swiftly advancing field, with new ideas emerging every other second. With technology becoming all pervasive in everyday life, opportunities for electronic engineers are endless. The Department is wide open to innovative ideas, methodologies to establish itself as the most sought excellent learning center in this part of the state. Our students are inspired to apply the classroom learning in the laboratories through experiments which helps them to become skilled engineers. I hope our students will prove to be an invaluable asset to the society & organization where they render their services. "The road to success comes through Hard work and self-imposed discipline"
The Department of ECE has its origin in the year 2013. The department offers BE programme and ME programme (Communication Systems) with a vision to produce globally competent professionals. The department has highly qualified and rich experienced faculty members coupled with younger talents and supporting staff. Within this 5 years of existence it has achieved several milestones in its widespread academic activities. A knowledge sharing and upgrading options are provided through various technical events like Symposiums, Conferences, workshops, seminars etc. The students are given international recognition by including IETE the professional body. The department involves in continuous improvement activity by interacting with national agencies like DRDO, CSIR, ISRO etc. Department of Electronics and Communication engineering is a constantly changing and widening branch of engineering profession, having applications in every discipline of engineering . The department of ECE , RCET offers BE programme and ME programme (Communication Systems) from Anna University Chennai, with a vision to produce globally competent professionals. 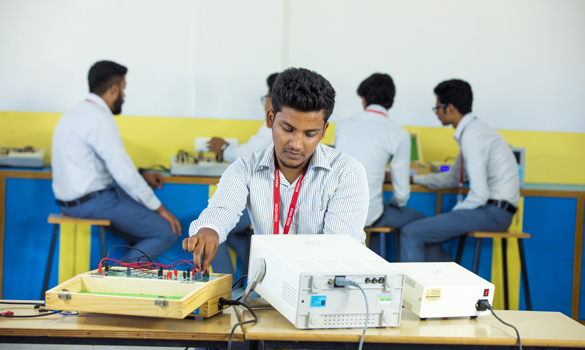 The primary objective of the department is to impart quality education, training and research at the undergraduate, postgraduate levels in various areas of Electronics and Communication Engineering. The major areas of faculty expertise of the department include Communication Systems, Control Systems, Digital Signal Processing, Image Processing, Multimedia Security, RF and Microwaves, Antennas, Speech Signal Processing, VLSI design and Wireless communication Systems. The highly qualified and rich experienced faculty members are striving hard continuously to improve upon the quality of education and to empower our students with latest technical knowledge and skills by providing with best teaching & excellent R&D environment. Faculty Counselors counsel the students. Counseling is done for slow learners in order to improve their performance and also to motivate the bright students to perform better. The students are motivated to undertake real-time projects and actively participate in the technical seminars, conferences and workshops and present their work in them. The department has state of the art fully equipped lab focused towards nurturing the students in practical aspects besides theoretical back ground like Electronics Lab, PCB & Electronics Workshop Lab, Digital Electronics Lab, Microwave Lab, Communication Lab, Digital Logic Design Lab. Linear and Digital Integrated Circuits Lab. Electronics Circuits II and Simulation Lab. Advanced softwares like Orcad Ps spice, Xilinx , Microsim 8.0 and Cadence are the pride of the department. The laboratories are well equipped with modern equipment under the supervision of qualified technical support staff. Equipment in the various laboratories trains the students to expose practical knowledge and illustrate the most important concepts in Electronics and Communication Engineering. The department has good and consistent placement record with students placed in many Core and IT companies. The department is associated with professional bodies like IETE and ISTE for faculty and students to enhance their research activities. Our department students won various prizes in kabaddi, boxing, and cultural competitions held in various engineering colleges. Excel in professional career and/or higher education by acquiring knowledge in area of Electronics and Communication Engineering. Analyze real life problems, design appropriate system to provide solutions that are technically sound, economically feasible and socially acceptable. By the completion of Electronics & Communication Engineering program the student will have following Program specific outcomes. The Vision of ECE department is producing innovative, creative and ethical Electronics & Communication Engineers with a research focus and to be recognized by the society as an excellent department, offering quality higher education and providing the needs of the public. To Provide a creative learning environment to the students in the domain of Electronics and Communication Engineering through effective teaching-learning process and best infrastructure.To Engage students in activities which inculcate awareness of professional and societal needs.